Not the nicest topic, but I think it’s good for anybody who’s been a victim of bed bugs to share their experience and hopefully help others with tips and suggestions on how you should handle the situation, as well as what to do when checking into hotels. Note: I don’t work for pest control so this isn’t official advice. This post is based on my own personal experience. 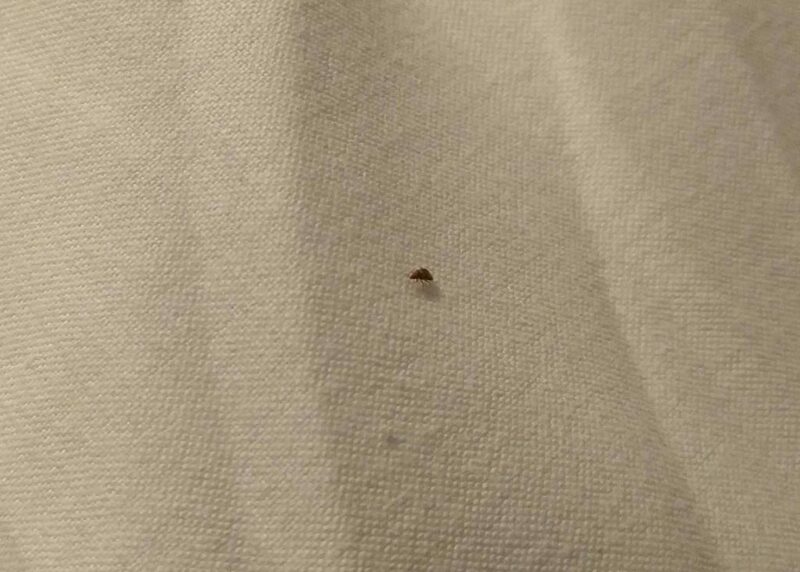 So my bed bug experience happened in the summer of 2016. I checked into a mediocre hotel and after the first night I woke up with bites on my arm and foot. I’d never had a bed bug experience before so I wasn’t really sure it was them. I then checked the room as thoroughly as possible (based on online advice) and found no sign of them. I was tired so dismissed the idea and put it down to bites from something else. Later that day after speaking to my other half on the phone and sending her pictures, she told me that it was definitely bed bugs. This conversation was quite late and on the evening of my second night. I then searched the room again with no luck of spotting them. I decided to sleep with the light on (although this apparently does nothing to keep the bed bugs away). As you can expect I was quite paranoid and didn’t sleep very well that night. I then woke up at 4.30-5am and saw a Bed Bug next to me. It was extremely small and this one wasn’t really moving. I then trapped it in a glass and took some photographs as evidence. I also spotted what looked like a baby one on the bedside table which seemed to be running around in circles. I also trapped this one and took photographs. Whenever you check in somewhere, especially if it’s a lower class or old run down type hotel, you should always search the room for Bed Bugs. 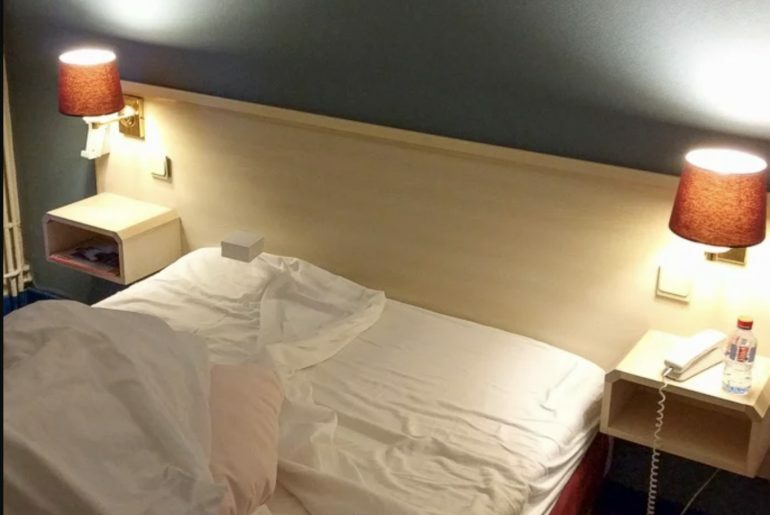 To be honest I didn’t see any when I checked into this particular hotel but discovered them the next day. Around the bedsprings, headboard and joints of the bed. Look near any cracks on the wall or any other furniture. Check around the luggage stand. To be honest, during my experience I didn’t find anything on checking in. Maybe it was a small infestation so in other scenarios there may be more signs. It’s definitely a good idea to check though, because if you didn’t check and it happened to you, then you’d be kicking yourself. 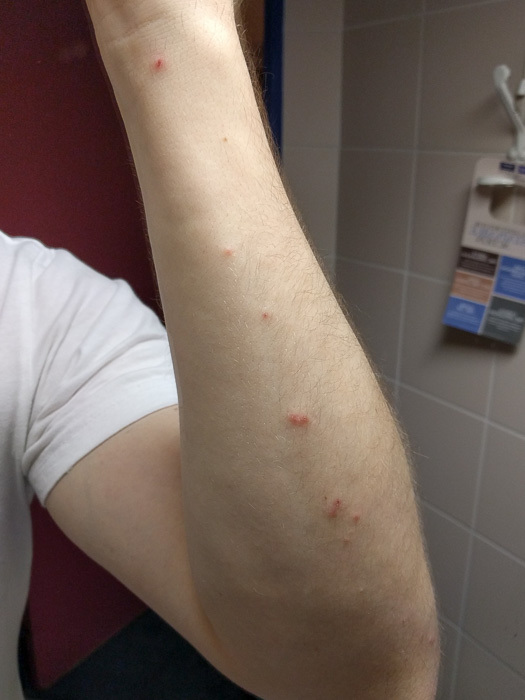 Bites on your body – For me, I had lots of bites in various places across my body and in clusters. I had them on my arm and feet (picture below) and they were incredibly itchy. Blood on the sheets – Due to the bites there was blood on the sheets. Signs of crushed bugs – You may potentially find signs of their shells, or even the bugs where you’ve crushed them in your sleep. During my experience and after the first night and signs of bites, I then checked the room about three times to try and find them without any luck. It’s only on the second morning that I found them when I woke up in the morning. Here are some of the things you should do if your hotel room has bed bugs (whether you find an actual Bed Bug or not). Take pictures of the bites on your body. Take pictures of any blood on the sheets. If you can see any bugs on the bed try and trap them. I used a plastic cup to do this. Take pictures if you see them, including how you trapped them. You may also find crushed insects or stains from their waste. If possible try and get the hotel staff to come and have a look to acknowledge the evidence. Demand your money back – For me, the hotel didn’t argue when I did this. If they do argue then threaten with exposure. Ask to change rooms, or try and change hotels if you prefer. Report to the booking agency – I went through Booking.com and to be honest they didn’t really say much and I guess they just act as a sale agent, but I still think it’s worth mentioning for their records. 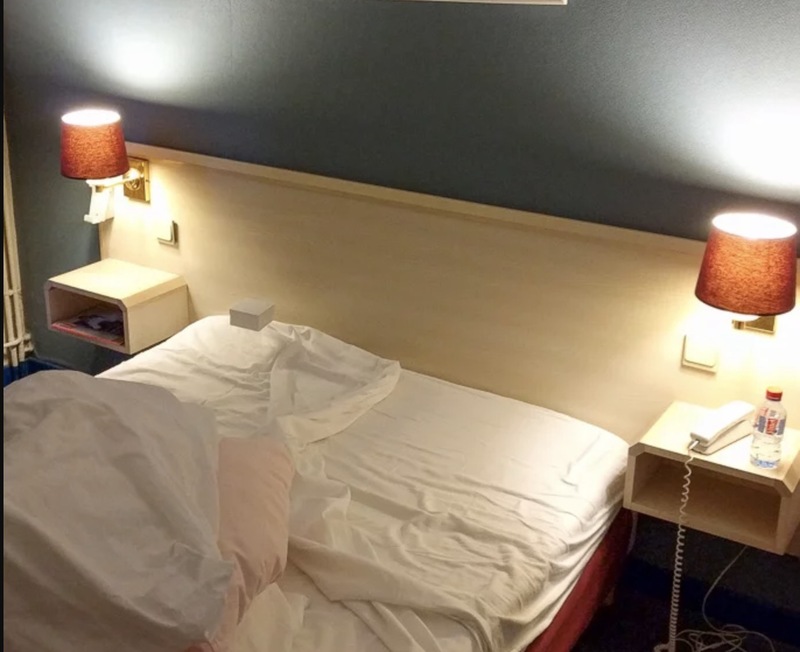 Leave a review – I think it also depends on how the hotel handles the situation as previous guests could have carried the bed bugs along with them, and the hotel could be perfectly clean beforehand. Leaving a negative review could be extremely damaging to a hotels business so keep this in mind. Put your clothes in sealed plastic bags. I left the suitcase out of my house and took the bags straight from the luggage into the washing machine. I then washed my clothes, followed by tumble drying at a high heat. I’d left my shoes outside and went straight to the shower. I actually did this wearing minimal clothes. After showering and putting on fresh clothes, I then hovered my luggage and shoes as thoroughly as possible and emptied the hoover straight into the outside bin after I’d finished. Consider contacting a pest control service. Quarantine your luggage until you are confident you haven’t carried one of the critters back with you. Despite this, there is always a chance they could still get into your house. I pray you don’t ever have a bed bug experience as it can be a horrible experience, but I hope this post gives you some idea of what happened to me and how I handled the situation. If you wanted to learn more about Bed Bugs also consider reading Bed Bug Guides on peststrategies.com which is an excellent guide. 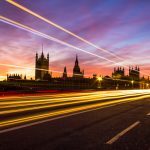 Hey Buddy!, I found this information for you: "Travel Tips: What to Do If Your Hotel Has Bed Bugs". 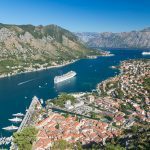 Here is the website link: https://www.travelanddestinations.com/travel-tips-what-to-do-your-hotel-has-bed-bugs/. Thank you.